This past week, HACC announced the receipt of the single largest gift in its history. What happened around Harrisburg last week? Here’s a summary of news and events that you may have missed. Capital Region Water last week said that it has started five water infrastructure projects that will extend through the early summer. The projects—four in Susquehanna Township and one in Harrisburg—may lead to road closures and detours until they’re completed. Click here for the complete story. Downtown parking may remain free after 5 p.m., as Harrisburg City Council last week introduced a resolution to renew the popular program. If passed, the city would enter into a one-year agreement with Dauphin County and the Harrisburg Downtown Improvement District to offer complimentary street parking daily starting at 5 p.m. Click here for the complete story. 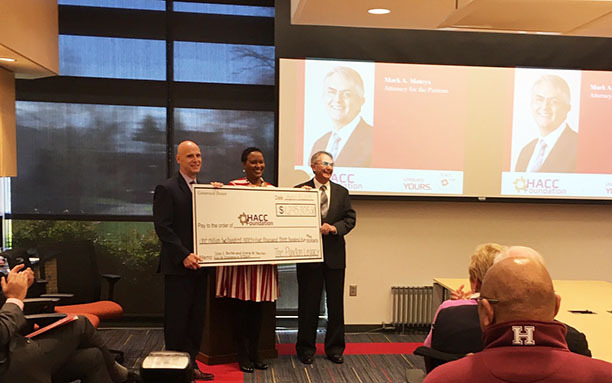 HACC last week announced the single largest donation in the history of the community college. The $1.3 million donation will establish the John E. Paxton and Gloria W. Paxton Fund for Excellence in STEAM. Click here for the complete story. Harrisburg City Council on Tuesday approved a contract with Maverick Strategies for a second, one-year consulting contract. After a two-month hold, council passed the $60,000 outlay by a 5-2 vote. In February, council tabled the proposed 2019 agreement with the Harrisburg-based lobbying shop, asking for detailed billing statements for the prior contract, which ended Dec. 31. Harrisburg University last week announced that city-based HHM has signed on as its hotel partner for the 17-story, mixed-use building it plans to construct in downtown Harrisburg. HHM will finance and own the 10-story hotel portion separately from the rest of the building, which mostly will house HU classroom space for its medical sciences programs. Click here for the complete story. TheBurg captured 16 Keystone Press Awards in the annual contest honoring the best in journalism in Pennsylvania, which was announced last week by the Pennsylvania NewsMedia Association. TheBurg won for work completed in 2018 in a wide range of categories, including for reporting, writing, design and illustration. Click here for the complete story. UPMC Pinnacle is taking its first step into Midtown Harrisburg, relocating about 40 administrative workers to the Campus Square building at Reily and N. 3rd streets. The relocation will free up more space at the main campus for patient services, according to President and CEO Phil Guarneschelli. Click here for the complete story.